A man on his way to dialysis Saturday morning, April 28, 2018, may have fallen asleep at the wheel causing him to crash in to a tree in Palmer. The incident occurred around 5:00 am Saturday morning at the intersection of Searle Street and Fairview Street. The man was driving a 2008 Ford Escape when he veered off the road and hit a tree head on, according to Palmer Police. The driver was trapped in his vehicle as the door had become wedged shut after striking the tree. Firefighters needed the ‘Jaws of Life’ to free him from his car. The driver is on dialysis and was en route to the hospital for his treatment. It is believed he may have fallen asleep at the wheel, which is what caused the crash. An ambulance transported the man to Baystate Wing Hospital for evaluation and treatment of his injuries. His injuries have been classified as non-life-threatening. 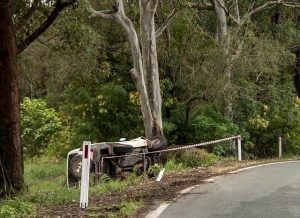 Police are still investigating the crash and what may have caused it, although it is believed he fell asleep at the wheel. The accident was cleared quickly, in about an hour, by the diligent work of emergency crews. It has been proven that driving while you are tired is more dangerous than driving while intoxicated. It is important that you do not drive if you have not gotten enough sleep as your reflexes are not as quick and your judgment may be slower than normal. You must remember, you are not only responsible for keeping yourself and your passengers safe while driving, but also the other drivers on the road. We care about you and your case here at the Law Offices of Jeffrey S. Glassman, LLC. After you’ve been injured, we would like to help you get the compensation you deserve. Do you feel you need legal assistance because another person’s negligence has caused you to be or a loved one to be injured? If you or a loved one have been killed or injured in a car accident, please contact the Law Offices of Jeffrey S. Glassman, LLC at (617) 367-2900 as soon as possible.